The Siglos+ 3 accepts 4K@24/50/60Hz signals on both HDMI inputs. Thanks to the precise 4K-Interpolation algorithm, it can upscale and display any resolution in a pristine 4K resolution. Siglos+ Series feature the latest evolution of the award-winning 4k-Interpolation engine and now it tremendously improves the perceived details and also generates greater picture depth. The new Siglos+ Series come with HDMI 2.0a connections, HDCP 2.2 and HDR compatibility. When a HDR content is detected, the Siglos+ can fully exploit its exceptional contrast ratio and brighter light output using the internal Perceptual Quantizer -SMPTE ST2084/86 EOTF- which renders a much more precise and natural picture. The Siglos+ 3 comes with an expert calibration menu available to the most demanding users. The colour panel has been drastically extended to DCI-P3 colour gamut, making the picture more vibrant and colourful. Thanks to the 5 presets, 10 custom picture profiles and the 14 precise colour presets, it has never been so easy to obtain a perfect picture. The artifact free Clear Motion Drive allows a true-to-life projection using frame interpolation or inverse telecine computation. Enjoy live events, TV shows and your favourite movies as if you were just behind the camera. Thanks to the new illumination system and optimised light engine, the Siglos+ 3 culminates on its category with an absolutely stunning 1,500,000:1 Contrast Ratio and 1900 ANSI lumens. 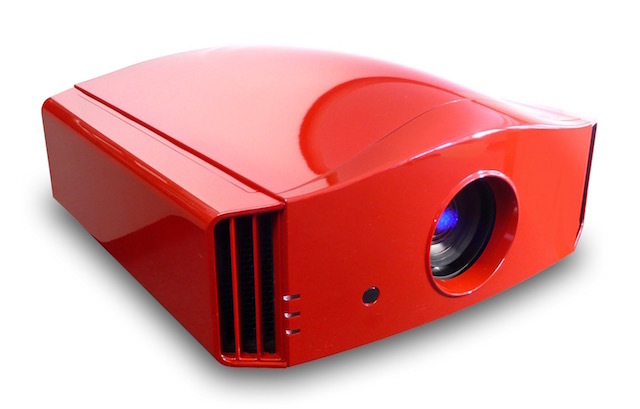 It can be used with very large screens up to 240 inches diagonal, for both 2D and 3D projections. 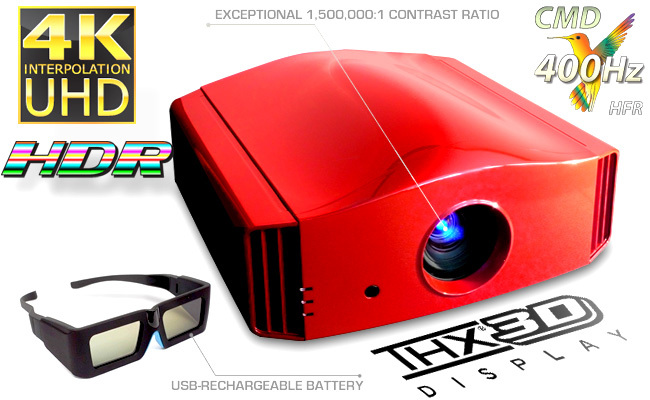 The Siglos+ Series have a light output of three times higher than the brightness of commercial cheaters, and thanks to the extremely clear and performance of the 3D glasses, the picture is brighter and more contrasted than ever. The Siglos+ Series are available in the classic glossy white and the “Infinite Black” finish. The Siglos “Life Collection” has been created for the most audacious interior decorators. Whatever your living-room dominant tint, choose the best colour for your projector, based on RAL classification. Display Resolution – 4K 3840×2160. Compatibility – HDR content, 4K streaming services and UHD Blu-ray disks Up to 4K60P 4:4:4/24-bit, 4K60P 4:2:2/36-bit and 4K24P 4:4:4/36-bit. Panel technology – 3-chip LCOS 0.7 inch panel. Optic slide cover – Yes. Screen Offset – Motorised Optical Shift +/- 80% vertically +/- 34% horizontally. Screen size – (16:9) 60” – 240” diagonal. Lamp consumption – 265 Watt NSH Bulb – up to 4,500 hours (with lamp used in low mode). Brightness – 1,900 ansi Lumens. Native contrast ratio – 150,000:1. Dynamic contrast ratio – 1,500,000:1. Colour Gamut – Up to DCI-P3. Noise Level – Less than 20 dB (in low mode). Inputs – 2x HDMI 2.0 a inputs [with HDCP 2.2 and 18 Gbps transmission band]. Adjustable lens aperture – Auto 1, Auto 2, Manual 16 steps. Expert calibration menu – Yes. Picture mode presets – 4 Presets + THX + 6 User Modes + 4 for Installation Expert only. Colour space profiles – 14 presets + 6 users. 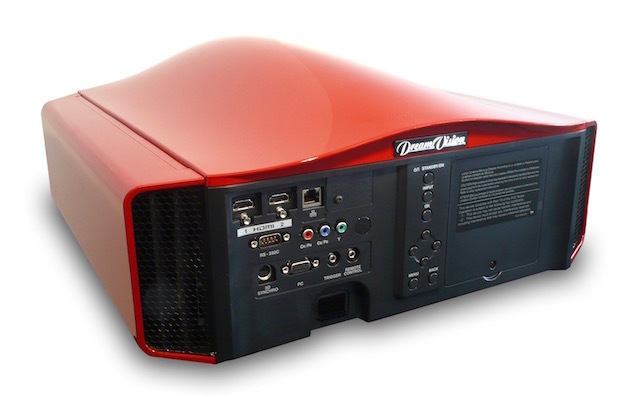 Home Cinema Video Processing – Blur Reduction and enhanced 400Hz Crystal Motion® (now also available in 3D mode and 4K), True Cinema Black IV ® (new Clear Black algorithm), 4K Interpolation (3840 x 2160), HDR (High Dynamic Range). Screen Adjustment – 255 Modes. 3D Compatibility – Frame Packing, Side-by Side and Top-Bottom (including 720p/1080p 24 Side-by Side) – 3D anamorphic V-Stretch. CMS Functions – Yes (7 Axis). Weight – 15.1 kg (33.3 lbs). Digital Keystone – Yes V+/- 16° (not in 3D Mode). Power voltage and consumption – AC 110~240V 50/60Hz 360 W / 4.8 W in stand-by / 0.4W in Eco-Mode stand-by 61x58x41 cm 19.5 kg (67x66x52 cm – 21.5 kg when shipped individually). Box Dimensions – 610x580x410mm – 19.5kg, (670x660x520mm – 21.5 kg when shipped individually). 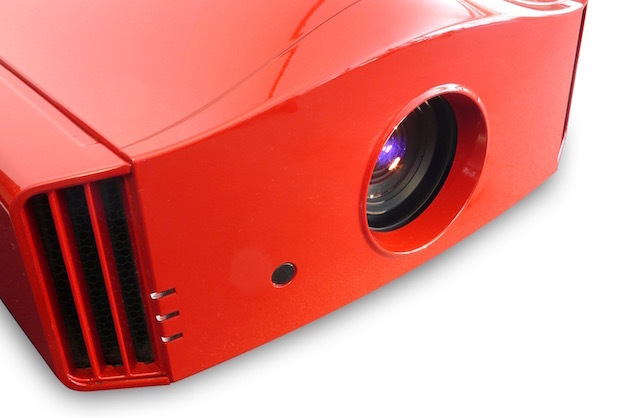 Options – 3D Glasses, Anamorphic Kit, Ceiling Mount Kit, Motorised Lift, Special Colours and Finishes, Projection Screens. Colours – Standard colours are glossy White and glossy Infinite Black. Life collection – Colours to suit your decor based on RAL classification – Add AUD$800.00. Siglos+ 3 4K UHD Active 3D Home Cinema Projector – AUD$20,750.00.